Shape: Slow cookers are available in two shapes: round and oval. The traditional round shape is perfect for making soups, chilis, and stews. The oval slow cooker can prepare larger pieces of food, such as whole chickens. 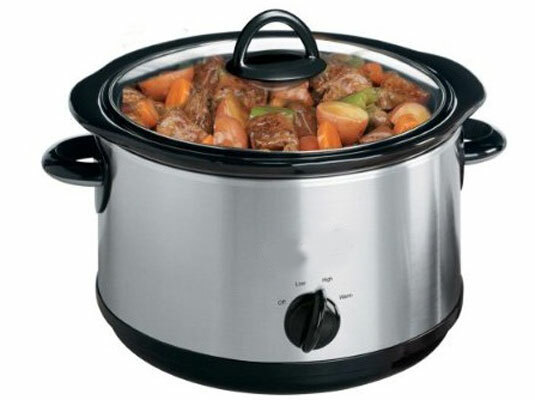 Size: For convenience, slow cookers come in a wide variety of sizes ranging from 1-quart to 7-quart capacity. The most popular size units are the 4- and 6-quart versions. Heat-resistant glass cooking containers: Some new slow cookers have cooking containers made of heat-resistant glass that enables the user to brown over the stovetop and then continue cooking in the same container in the slow cooker. Nonstick coating: If you don’t want to have to spray your slow cooker’s container with vegetable oil cooking spray, get a slow cooker that has a nonstick coating on the cooking container. Divided container: You can find slow cookers that come with an inner pot that’s divided into two separate cooking compartments. This divided cooking system enables you to make two different dishes at the same time. Digital settings: You can now find some slow cookers with a digital display. With the simple push of a button, you can choose the cooking time and temperature you desire. Easy-transport innovations: You might want to get an attachment that anchors the lid to the base for trips in the car or an insulated carrying case.